Scotland’s biggest union has called for governments at Westminster and Holyrood to invest in new infrastructure to help take advantage of untapped offshore oil and gas. Today (Wednesday 19 October), the Oil and Gas Authority (OGA) published research on the potential of small pools of oil and gas in UK waters. It estimated that there was an equivalent of more than three billion barrels of oil untapped underneath the UK continental shelf, and described it as a ‘very significant opportunity’. Unite Scottish secretary Pat Rafferty said: “Scotland’s oil and gas industry is going through a crisis. The number of jobs lost as a result of the downturn in the UK oil and gas sector could be above 120,000 by the end of 2016. “But today’s research shows that there is potential for a new lease of life for the offshore industry in Scotland. Companies should be encouraged to use their existing rigs and pipelines to recover pools wherever that’s possible. “However a number of these small pools lie further away and will need new stand-alone solutions. Our governments could use their borrowing powers to take out public stakes in new offshore infrastructure. That would encourage companies to also invest, would support jobs, and would create returns for the public purse as the oil and gas from these pools begins to flow. For more information or to arrange an interview, contact Unite Scotland press officer David Eyre on 07960 451631. More information about the Oil & Gas Authority report can be found on their website here. Two Norwegian workers’ unions, Industri Energi and Safe, have warned about an increasing frequency of incidents on the Norwegian Continental Shelf following three separate incidents over the past weekend. All three incidents occurred on Statoil-operated facilities offshore Norway. First, a well control incident occurred on the drilling rig Songa Endurance on Saturday. Statoil had to evacuate 20 out of 107 workers from the rig. Next, a fire broke out on Sunday aboard Statoil’s Statfjord A platform, in the Norwegian sector of the North Sea, prompting a production shut down. Later on Sunday, Statoil also had to shut down production at its Gullfaks A platform in the North Sea after a gas alarm was triggered. The production was restored late last night. Industri Energi’s Håkon Aasen Bjerkeliveien said the union is worried about an increasing frequency of incidents and that it is time for the offshore safety agency, the Petroleum Safety Authority (PSA), to adopt a more aggressive approach. He also said that it is too early to talk about the causes of these three separate incidents, but directed a warning to the industry. The safety authority informed on Monday it launched investigations into incidents on the Songa Endurance rig as well as on the Statfjord A. However, there was no mention of the incident on the Gullfaks A platform. Safe’s Hilde-Marit Rysst warned that cost-cutting has resulted in less maintenance and employees without training on the drill floor. Rysst acknowledged it was too early to talk about the causes, but noted that many of its members have been concerned about cuts in maintenance work and fewer workers on the platforms. Oil and Gas People reported yesterday that a CHC S92 Helicopter was escorted back to Aberdeen after declaring an emergency while flying offshore. The helicopter landed safely just after 7pm on Sunday evening. Unusually the helicopter was closely followed ashore by another S92 aircraft operated by Bristow Helicopters. Oil and Gas People has today learned from two separate sources close to the incident that the emergency was declared after an engine fire warning light illuminated in the cockpit. We are reliably informed that the flight was a shuttle flight to transport workers from the Franklin Platform back to the Elgin PUQ who were day tripping. The emergency was declared on route to the Elgin Platform. The helicopter circled the Elgin Platform and asked the HLO (Helicopter Landing Officer) to check for signs of fire. When given the all clear the pilots then made the decision to return to Aberdeen and requested the assistance of a Bristow Helicopter to tail them in as a precaution. When asked for a statement a spokesman for CHC said: “CHC can confirm one of its S92 helicopters made a precautionary return to base in Aberdeen after a cockpit safety warning light was activated. “Crew followed procedures and were in contact with air traffic control at all times. “The aircraft landed without further incident. On September 29 the Norwegian oil company Statoil issued the report on its investigation into the April 29 fatal crash of a CHC Airbus Helicopters EC225LP. The helicopter was transporting 11 of its personnel from the Gulfaks B offshore platform in the Norwegian continental shelf (NCS) to Flesland. It crashed en route after the main rotor assembly separated from the aircraft in flight, near the small island of Turoy, west of Bergen, killing the passengers and the two pilots aboard and prompting a worldwide grounding of the fleet in June. The ban was lifted by the EASA earlier this month, but it remains in force in the UK and Norway. Investigators for the Norwegian Accident Investigation Board (AIBN) have yet to formally determine the cause of the crash, but the EASA has cleared the helicopter for return to service following replacement of a main gearbox planet gear and a heightened inspection regime. The purpose of the Statoil report is not to determine the cause of the crash, but to evaluate its own related helicopter commercial and safety policies and to make recommendations for improvement. The findings provide a window into the economic pressures North Sea helicopter operators have been facing in the current depressed global energy environment. Activity in the North Sea has diminished greatly in recent years. Statoil notes that passenger volume, flight hours and the service fleet have all declined significantly since 2013 in the NCS, with the passenger count dropping to a projected 151,000 this year from 211,000; flying hours shrinking to 19,000 from 25,500; and the aggregate fleet in the region standing at 13-14 from 18-19. Statoil notes that the Sikorsky S-92 was already the dominant helicopter in the region for passenger transport, with only two Airbus H225s in that role, but five H225s flying in the SAR mission. Two main operators service the region, Bristow and CHC. Statoil currently procures helicopter services from Bristow Norway and Integra Leasing (with CHC Helikopter Service a subcontractor) via five- to 10-year extendable contracts with individual contracts for flights from Stavanger, Bergen, Florø, Kristiansund, Brønnøysund and Hammerfest. Statoil’s Norway-based operations and activities represent about half of the helicopter transport on the NCS. Statoil’s report notes several safety “vulnerabilities,” beginning with its own oversight of helicopter operations. The company notes that its helicopter safety oversight is currently conducted by four experienced people nearing retirement age, making the team “capable but vulnerable.” It further notes that the terms of its commercial contracts with operators might create safety vulnerabilities. “The investigation team has assessed whether there are sides to the helicopter contracts that can harm safety. Related factors that have been highlighted are how the helicopter contracts are entered into and administered, together with the contracts’ conditions regarding how much time can pass between flights, and the consequences of delays. An additional factor concerns the helicopter operator’s “economic and financial condition.” The latter appears to be a direct reference to CHC, the operator of the accident helicopter, which filed for bankruptcy six days after the crash. The report goes on to state, “The contracts specify that the helicopter operators do not receive payment in full if the transport services are delivered too late or are not delivered at all. The definition of ‘too late’ and ‘not delivered’ varies from contract to contract: for example, a service may be classified as ‘too late’ if it is delayed by more than two hours, whilst a service may be classified as ‘not delivered’ if the delay exceeds eight hours. The price for a service cannot be reduced if the delay or ‘non-delivery’ occurs as a result of weather or factors on Statoil’s side. “Several of the individuals that the investigation team has spoken with have questioned whether the ‘penalty’ regime may negatively affect helicopter safety. Some have maintained that the system can contribute to stress amongst pilots and mechanics, and therefore increase the risk of making mistakes or ‘stretching it too far.’ Further, it has been pointed out that work operations can be disturbed if resources are redirected in order to avoid a penalty. It has also been indicated that requirements for shorter turnaround time and fewer reserve helicopters will lead to an increase in the total number of potential delays, and therefore also an increase in the total number of situations where the aspects of the penalty regime mentioned above may occur.” The report recommends devising alternate means to encouraging punctual service that do not jeopardize safety. The Norwegian firm issued a notice on the workplace accident late on Wednesday. “Five people were sent to Haukeland Hospital after having been exposed to H2S gas (hydrogen sulphide). Relatives have been notified,” Statoil said in a statement. 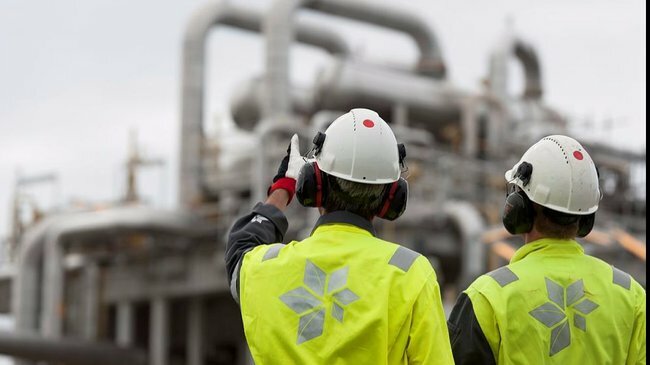 The five people were exposed to the poisonous gas while working at a treatment facility for oily water inside the Statoil-operated terminal area, Statoil explained further. According to the company, gas readings were carried out and there is no risk of further exposure. “The police have commenced an investigation and, together with the Petroleum Safety Authority Norway (PSA), will conduct further investigations on Thursday,” the statement adds. In the meantime, emergency services and the authorities have been notified and Statoil has mobilised its emergency response organisations in Sture and Stavanger. “It is still too early to provide information about the cause of the incident. Statoil will also carry out its own investigations to determine how this could have occurred,” the company stated further. 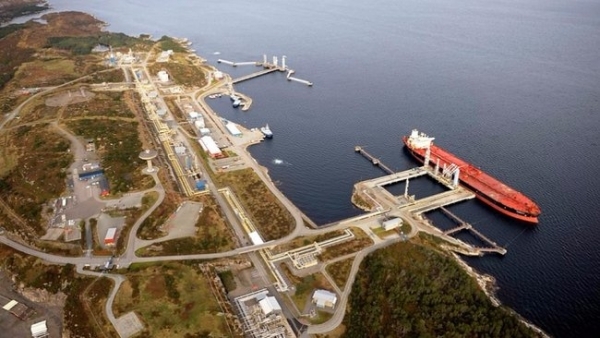 The Sture terminal is a port for crude oil shipments which receives crude oil and condensate from the Oseberg area through an oil pipeline and crude oil from the Grane field and Edvard Grieg through a different oil pipeline. Hydrogen sulphide is a chemical compound that can poison different systems in the body, with toxicity comparable with that of carbon monoxide. Short-term high-level exposure to the gas can lead to immediate collapse, with loss of breathing and a high probability of death. However, the effects depend on the concentration and the duration of the exposure. While high concentrations can be fatal, lower concentrations can cause only mild respiratory symptoms. Oil operators and helicopter companies have recently banned the Samsung Galaxy S7 Note from being transported offshore and onto platforms and drilling vessels themselves. However one oil major has went one step further and banned the devices from entering their premises. Upon entering a meeting at Shells Aberdeen premises, one oil worker was specifically questioned as to whether he owned a S7 Note and was advised that he would not be permitted to enter the building carrying the device. The move comes days after Samsung announced the S7 Note is no longer safe for use and must be ‘switched off immediately’ due to a possibility of the device exploding. Helicopter operators Babcock, Bristows and CHC have confirmed they are no longer allowing the device to be transported offshore, whilst the main North Sea operators confirm they have taken steps to ensure no devices are present in the offshore environment. Repsol Sinopec have confirmed the device is banned on all their installations. ConocoPhillips have been contacted for comment but have declined to comment.